This body camera is advertised, manufactured and distributed by several Chinese companies. In America, it’s sold by several US based vendors. This body camera has a fixed static lens and no external POV camera option, limiting its mounting options and recording angles. Officers with taller stature or bigger chest, risk ending up pointing the camera to the sky. Drawbacks of the camera include its weight and size. At 5.3 ounces, the camera is bulky and pulls on the uniform. The camera comes with a 1.5″ rotatable clip, which may not be long enough to provide a solid secure grip on most uniforms or could easily fall off in a chase or struggle with a suspect. The clip itself is not very strong and seems like it will loosen and wear out quickly with regular use. This body cameras clip is non-adjustable; the “hinge” style connection is close to the camera, giving no room for pivoting the camera for better video angle. The camera also comes with an optional 4″ epaulet mount. The epaulet mount does have a rotatable hinge where the camera clips on presumably to be able to angle the camera better. At the connection point, the mount is “floppy” and dangles on the shoulder and would easily flap up and down in a chase or struggle with a suspect. In critical moments like that, you want a steady video picture, not a shaky, unsecured, bouncing up and down video image. This body camera has a 9-hour battery life. The camera offers one touch recording capability. The camera operates by buttons only (no switches). The buttons beep loudly when pressed. (We recommend switches over buttons because it is possible for an officer to forget they pressed the button and in some cases you must press and hold the button for several seconds before the camera activates; with switches, the officer can quickly visually and physically feel that the switch is up or down; to confirm it is turned on). To activate the body camera, you can either press and hold the power button for 3 seconds or press the video button for one touch record. 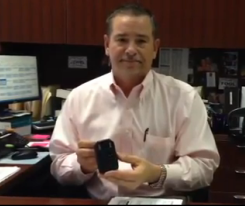 There is about a 3 second start up time before the body camera starts recording. There are 7 buttons on this body camera all scattered around the unit. The buttons beep when the body camera is turned on and each time they are pressed. There is a 2″ playback screen on the back that can be deactivated by pressing the “M button”. Playback screens are useful, but tend to drain a lot of battery life. You can access and play back files, but there seems to be no way to configure the body camera options using the playback screen. The camera’s status light is continually lit up when the camera is powered on and the status light turns red when its recording. This status light risks giving away the officers position at night or if an officer is in a tactical situation. The camera seems durable. The casing is thick plastic. The manufacturer says the camera has a 10 foot drop resistance. The camera is IP67 Waterproof rated, which prevents water or dust from reaching the internal components. The top video quality is 1920/1080pHD but the 160-degree field of view gives the video a slight distorted “fish eye” look. The body camera has Infrared night vision. Pressing and holding the “M button” activates IR mode for up to 33 feet of night vision. 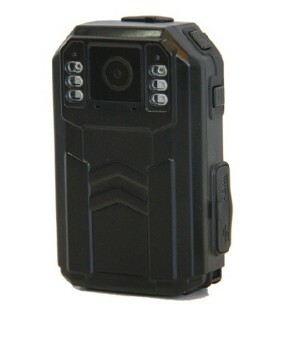 The body camera offers still picture, audio only and video recording functions. 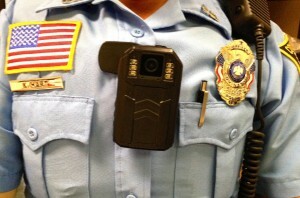 The camera has a Push to Talk (PTT) feature that allows an officer to connect the body camera to their police radio and use the body camera as a speaker microphone to save space on the uniform. The PTT Connector looks like a headphone style jack and may not accept all radio interface connections. The camera does not have a pre-record capability or Internal GPS. Pre-record has become popular as a way to back up video if an officer is caught in a sudden situation like a fight or struggle with a suspect, where they need to react quickly and do not have time to activate the camera. An optional separate GPS module is available. Have you used this body camera? We’d love to include your feedback and opinions, click here to send us your review!